Region 6 Behavioral Healthcare presents the Independent Living Class on Cooking for Wellness & Recovery. Participants will learn how to cook healthy recipes that are simple to make at home! 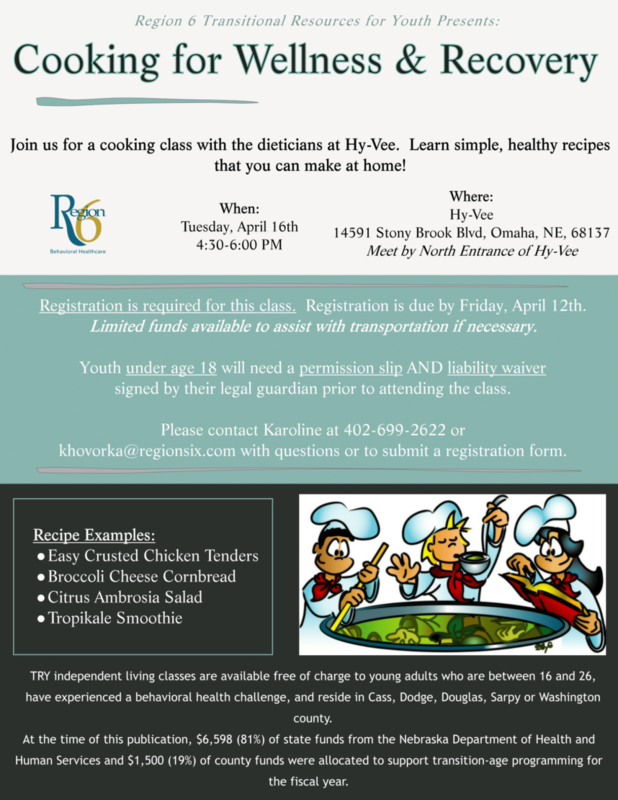 This course will be presented by the dietitians of HyVee. Registration is required for this class. A permission slip/waiver, signed by a legal guardian, is also required for those under age 19 prior to attending Region 6 classes. Please register for this class by Friday, April 12th. TRY independent living classes are free of charge. The classes are available to young adults between the ages of 16 to 26, who have experienced behavioral health challenges, and reside in Cass, Dodge, Douglas, Sarpy, and Washington counties. Please contact Karoline with any questions or to register at call office 402-996-8193, cell 402-699-2622 or email khovorka@regionsix.com.